Among the most fun Reading Games for Kids is discovering words that rhyme. The Boy and the Filberts is a moral story about a boy who gets his hand stuck in a jar of nuts, because he tries to take too many. Younger kids can try to find the most rhymes for a chosen word. Older kids can try to create their own rhymes from other short stories. Scroll down to see the Top Five Reading Games for Kids. Hit this link for more original Aesop's Rhymes. Then found himself in a bind. So many he couldn't believe it. Are not a good fit for each other. Try as he might, he could not break free. So the little boy screamed for his mother. “And your hand will escape from the jar. Moral: When a burden outweighs you, make two trips. The following Reading Games for Kids can produce some wonderfully creative results. Reading Bingo - Play BINGO using words instead of numbers. Mark any words that rhyme with the chosen word. Rhyme Teams - Divide players into teams, and have the teams take turns calling out a word, to which the other team has 10 seconds to shout out words that rhyme with it. Whichever team comes up with the most rhymes wins that round. Rhyme Poker - Play poker using cards with words printed on them. One word per card. The object is to find rhymes. Deal each player 5 cards, allow 1 or 2 rounds of exchanges, then have players show their cards. The same rules apply as in ordinary poker. For example, if you have 3 rhyming word cards, it's Three of a Kind. If you also have a pair of words that rhyme, that would be a Full House. Rhyme Scavenger Hunt - Write a word on each slip of paper, with words that rhyme with it (as well as words that don't) on other slips of paper. Hide all the words except one, which stays hidden. Send the kids hunting for rhymes. Whoever finds the most rhymes wins. 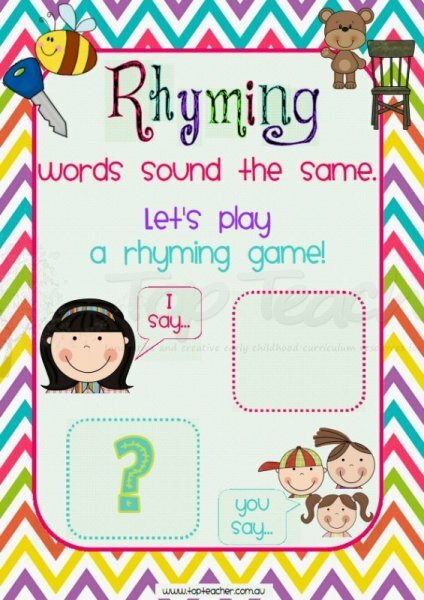 Race Against Rhyme - Have all players write as many rhyming words as they can think of within a set time limit. The player with the most rhymes wins. Visit here for Lion Tales. See this page for more Aesop's Fables, other short stories, printable poems, and more.